In high school, I was a three sport Varsity athlete since freshman year. During the soccer season, I would play about every position on the field due to my endurance, but, ironically, keeper was my best position. In the winter, I was known for my defensive skills as a basketball player. My best sport was softball, where I played shortstop and was a switch hitter. What’s degrees do you have/are you working towards? What training / athletic coaching certifications do you have? I graduated with a B.S. in Exercise and Movement Science from UVM in 2014 and am currently pursuing my Doctorate of Physical Therapy at UVM as part of the Class of 2016. 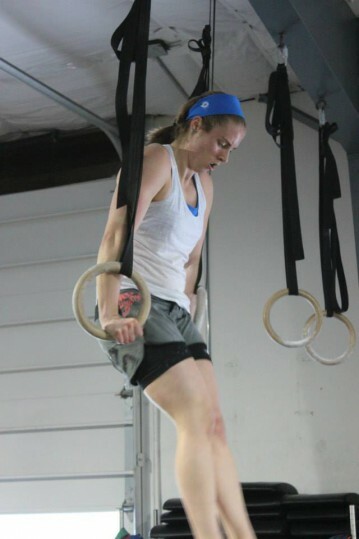 I love Crossfit because of the variety of training and because it makes me feel like an athlete again. Everyday presents a new challenge, a new combination of exercises, and a new opportunity to push myself. The number of movements to tackle and perfect is endless, so I am always able to find some area to work on, to train, to improve. Combine this with the amazing community and family at TT, you get that team feeling, that feeling that we are all in this together, pushing each other and helping each other improve. A feeling I cherished and missed from playing team sports, but now get to share with all my friends and family at TT. My favorite WOD is one that I haven’t done yet, but assume I will love because it has three of my favorite movements in it. Who wants to try it with me!? !Why do you love CrossFit TT? It is very hard for me to put into words why I love Crossfit TT. You have to experience it on your own to truly grasp what I love about the place. Part of it is the quality of coaching. Part of it is the community. Part of it is this X factor that I can’t quite put my tongue on. All I know, is I find myself there the majority of the day whether working out, coaching , or just hanging out with members, and I love every moment of it. I love coaching and teaching, whether it be basketball, soccer, softball or school. Therefore, coaching the sport of fitness seemed like a natural progression. My favorite moments are when members meet a goal, have that “ah-ha” moment when a movement clicks, or turn to one another to strategize and improve their lifts.What gets you through a hard workout? The support of the community and my friends telling me to fight and keep pushing until the very end, whether present or just mere voices in my head.